Last year a delegation of Kitsap economic development leaders attended the Paris Air Show. This year, it’s England. County commissioner Charlotte Garrido, Kitsap Aerospace and Defense Alliance co-chair Tim Thomson and John Powers of the Kitsap Economic Development Alliance are at the Farnborough Airshow outside London this week. The trip was organized and funded by KADA. The Kitsap are meeting with aerospace companies to promote the county’s potential as a manufacturing center. They’re part of a large Washington contingency that includes Gov. Jay Inslee. The air show continues through Saturday. Pictures from Farnborough are being posted on the KADA Facebook page. Photo: From left, Tim Thomson, Charlotte Garrido, Gov. Jay Inslee, Trudi Inslee and John Powers. Contributed photo. Kitsap Economic Development Alliance will offer a host of free workshops over the next two months for small business owners interested in government contracts. The Kitsap Economic Development Alliance used its Decision Makers Breakfast last week to unveil a brand new website. The site includes information for businesses, industry profiles, statistics, a blog and media galleries, among other features. The website redesign was combined with a general rebranding for the organization. If you missed the annual breakfast, the economic forecast delivered by John W. Mitchell is available via PowerPoint. 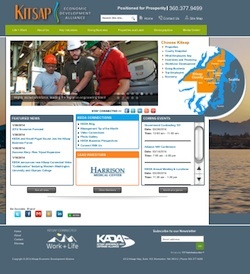 KEDA works with businesses and local governments to promote the Kitsap economy. Attracting tourists, wooing movie biz and navigating government contracts are a few of the topics to be discussed at Global Entrepreneurship Week events around Kitsap. The local iteration of the “world’s largest celebration of the innovators and job creators” begins Monday afternoon and continues through Friday at locations around the county. The Kitsap Economic Development Alliance coordinated the discussion series.